ManageFlitter lets you manage multiple Twitter profiles more intelligently. You can sort your followers/following lists by a range of criteria, discover new people to follow based on advanced search functions, and find out when your followers are online and schedule tweets appropriately. 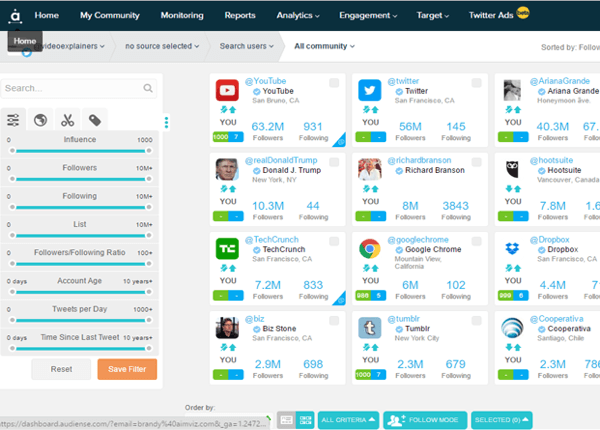 The tool also will track who unfollows you and let you search for relevant accounts and tweets. ManageFlitter makes it easy to manage your Twitter account. The web app is free with limited features. Upgrading to a paid plan will give you access to the more advanced features. To keep your following/follower ratio in check, it’s necessary to unfollow people from time to time. Two easy ways to identify people to unfollow are to look at the Not Following Back and Inactive lists. Unfollowing people on Twitter is sometimes necessary. Sort the Not Following Back list by the date you followed people. That way, you can see who hasn’t followed you back after a long period of time. Sort the Not Following Back list by Follow Order. Also, if any accounts are inactive and haven’t tweeted in a while, you might want to unfollow them to make room for more active accounts. 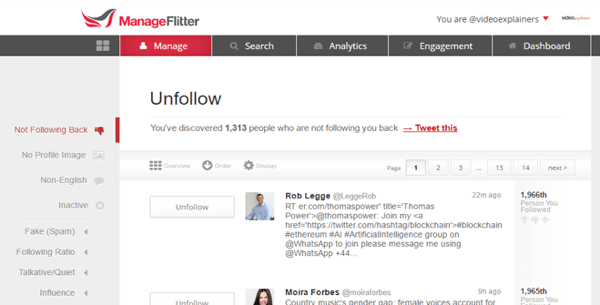 Unfollowing people in ManageFlitter works pretty much the same as following them. You can even use the Batch Select feature to speed up the process. ManageFlitter lets you search tweets by topic (or keyword) and/or location. You can search through the most recent 1,500 results per keyword or phrase, or the last seven days’ worth (whichever is smaller). You can follow accounts associated with your tweet search just as you would follow any other account. This is a great way to connect with people who are talking about topics that are most relevant to you. Bonus tip: After you’ve conducted a tweet search, try ordering the results by Influence to find high-value Twitter users to connect with right away. PowerPost is another useful feature. It lets you schedule your Twitter content at optimal times based on when your followers are most active online. PowerPost will schedule posts for you. 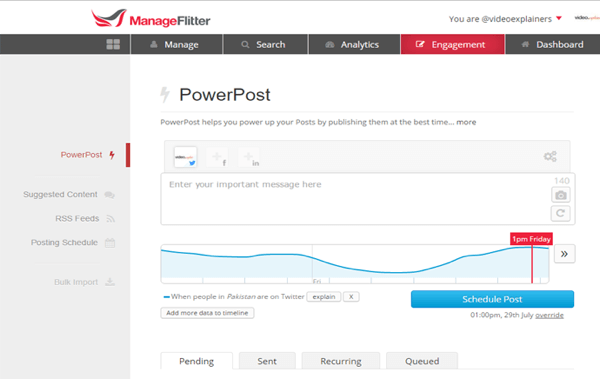 ManageFlitter helps you follow the right profiles based on your marketing goals. After all, one of the best ways to gain traction on Twitter is to follow certain accounts. If your interests align, hopefully many of those users will follow you back. Power Mode lets you set up a number of search parameters and filters. Once you’re in Power Mode (which is like an advanced search), click on Create Filter in the upper-left corner to begin setting up a new search. What good is Twitter marketing if you can’t track what you’re doing? Get analytics about specific words, hashtags, usernames, or websites. Note that some analytics features are available only to business or pro accounts. 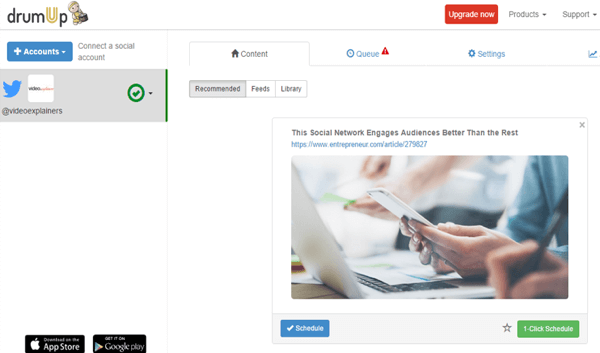 Audiense, formerly SocialBro, is a popular enterprise-level Twitter management tool that’s available for both beginners and pro users. It helps you find influencers to connect with, determine the right times to tweet, and run automated direct message campaigns. You can also easily bulk follow and unfollow, and find like-minded Twitter users. Audiense lets you see important Twitter information at a glance. With Audiense, you can create your own custom social media dashboard so you can quickly see the stats that matter most to you. Here are some features that can help improve your Twitter marketing campaigns. 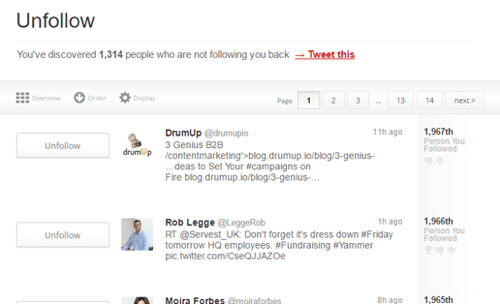 If you want to find new people to follow, click Target and select Discover New Twitter Users. In the Search fields, you can enter keywords, the name of a person, or a location to filter the people you want to find. Audiense lets you discover new Twitter users. If you go to My Community, you’ll see a number of options to filter your current community. You can filter your Twitter community in a number of ways. For example, you can filter your community by influence. Audiense has access to the Kred score of each Twitter user. Kred scores are a ranking system where people are ranked based on an algorithm that calculates their influence. If people have a high score, it’s more likely that they have an engaged community. If you want to filter results by number of followers, select a maximum/minimum for the number of people users follow or are followed by. If someone has 10,000 followers, but they only follow 10 people, they’re unlikely to follow you. So you may want to search for people who have similar follower/following numbers. If you’re looking for really active people on Twitter, specify a high number of tweets per day. You can select Time Since Last Tweet to filter out people who haven’t tweeted in 6 months, for example. 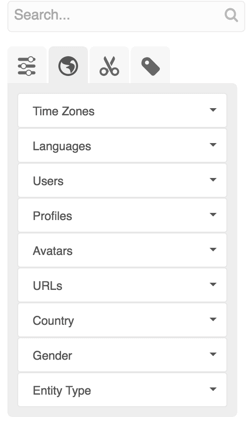 There are also demographic-based filters for specifying time zones, languages, etc. You can also apply demographic-based filters. Audiense provides analytics for your account and/or your competitor’s account. Audiense lets you generate analytics reports for your account. 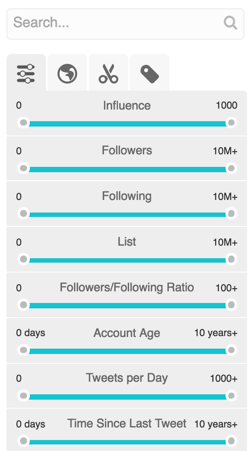 With Community Insights, you can view a breakdown of your followers, with information including languages, nationalities, genders, if they have avatars, etc. Look at Best Time to Tweet to see when you should post your content to maximize exposure and engagement. Tweet Analytics will let you view detailed analytics on the tweets you send, such as the number of favorites, mentions, retweets, etc. With Real-time Analytics, find out which Twitter users are tweeting right now so you can engage them in conversation or target content. 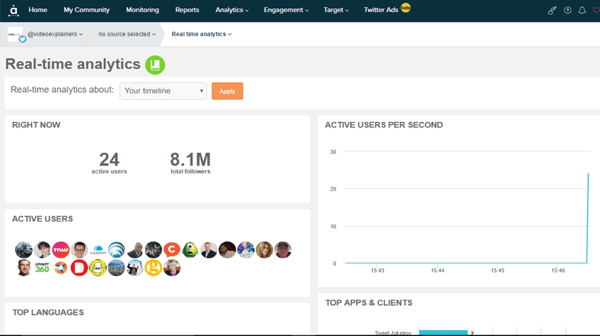 You can also get real-time insights on your followers’ languages, Twitter apps and clients, and potential reach. Find out which Twitter users are active in real time. Select Account Comparison to compare up to three Twitter accounts. Find common followers, influencers, locations, languages, and other useful insights to help you get an edge. 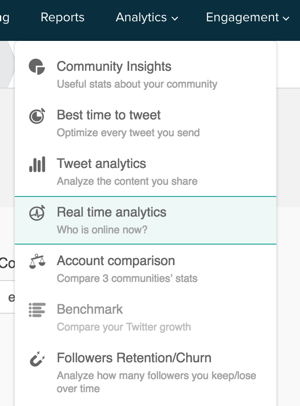 Benchmark will let you compare your account stats with similar accounts. Follower Retention will show you how well your Twitter account engages your audience. With visual representations, you can view the churn rate of your account, engagement stats, and audience retention data. If you want to increase your followers, make sure there isn’t too much churn. 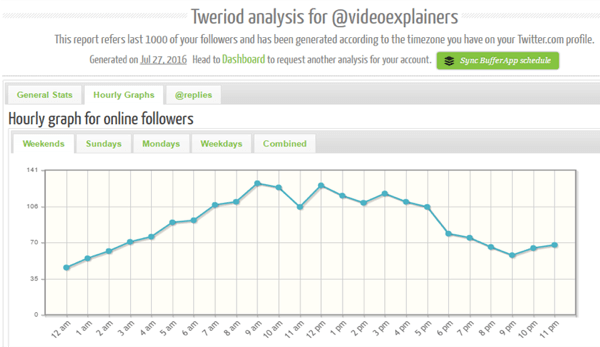 Tweriod is a great tool to keep track of the times when your followers are most active. Use the data from this tool to schedule your tweets during the most interactive period of the day for better engagement and results. Schedule your tweets at times when most of your followers are online. 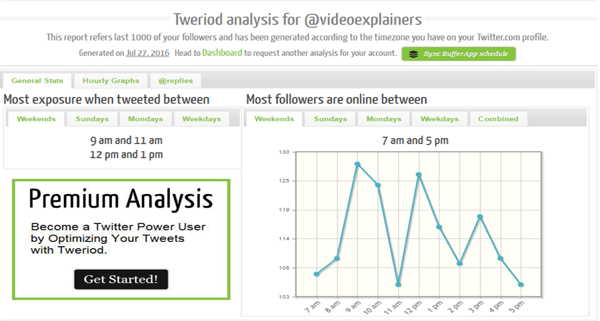 Tweriod analyzes the performance of your past 200 tweets, which is pretty standard for most timing optimization apps. It also looks at the performance of your followers’ past tweets. It shows when they most often tweet and are online. This information can help you determine your optimal tweeting times. Tweriod will give you suggested schedules for different days. The tool excludes any tweets generated via automation apps. The reason is simple: users aren’t truly online if an app tweets for them. Tweriod will generate a free basic analysis of your account, but you’ll need to upgrade to a paid account to get a premium analysis. Rather than waste hours trying to come up with the right content to tweet, use DrumUp to get fresh, intelligent content to share. 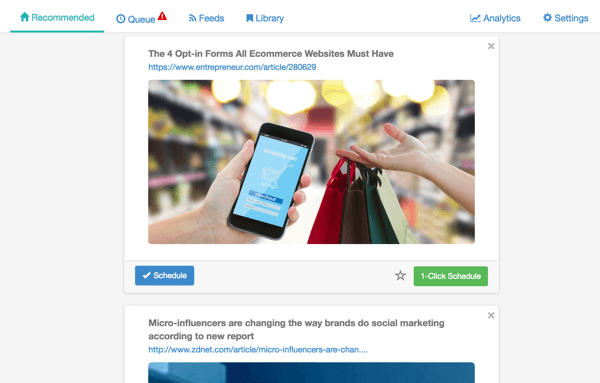 The dashboard shows your social accounts on the left and recommended content and custom feeds on the right. DrumUp helps you find interesting and relevant content for your target audience. Under Settings, add keywords for topics you want to talk about on that specific account and choose how many posts you want to send out per day. In the Negative Keywords field, add any keywords you don’t want your suggested content to include. You can also get a top stories summary delivered to your inbox. Add keywords for the topics you want to tweet about. After you enter your keywords and complete your settings, DrumUp starts pulling in stories based on those settings. For the most part, the content should be relevant, but occasionally you may see content that’s only loosely related to your keywords. Even then, the randomly suggested content sometimes can come in handy. 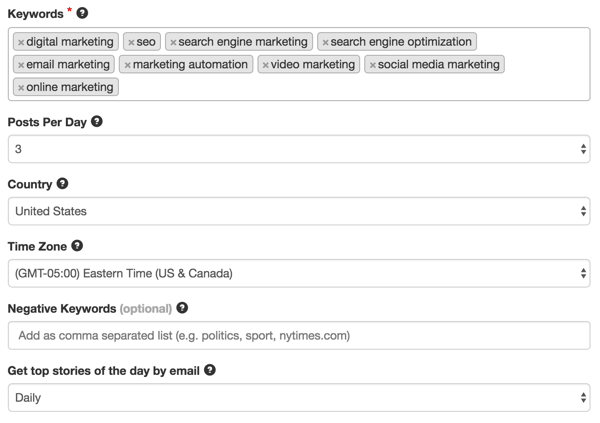 DrumUp will suggest content based on your keywords and settings. Bonus tip: The tool’s employee advocacy feature lets you invite employees to share brand content that you manage. This feature not only increases brand visibility, but also helps your business maintain a consistent Twitter campaign. These four Twitter tools can help you manage your account and engage with your audience. Regardless of your goals, a sound Twitter campaign, with the help of these tools, can pay dividends for your business.